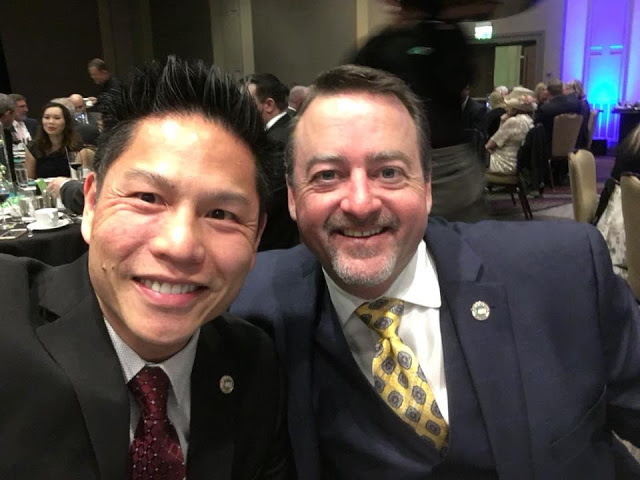 Elk Grove City Council member Darren Suen accepted over $3,000 in gifts according to legally required financial disclosures. According to the California Form 700 filed with the Elk Grove City Clerk’s office, Suen reported acceptance of 21 gifts that he valued at $3,014. Those gifts, which were for conferences and meals, came from 19 entities, many of which are development related. Among development related organizations that Suen reported accepting gift from were Cresleigh Homes, $80 luncheon; Teichert, $145 luncheon during the annual Cap to Cap lobbying trip to Washington DC; Sacramento Association of Realtors, $45 luncheon; Northstate Building Industry Association, board installation $135 and $65 anniversary dinners; and Mutual Housing California, $200. Other notable gifts Suen received include a $100 ticket to the State of Downtown [Sacramento] from the city’s garbage collector, Republic Services. Suen’s complete report can be view on the city clerk’s website. Other city council members reporting as of today include Steve Detrick, who reported one gift valued at $300 for dinner tickets from Pappas Investments. The other three council members, Mayor Steve Ly, Vice Mayor Pat Hume, and Stephanie Nguyen have not yet filed their disclosures.